The name means ‘Adam’s Grove’. On 10th June 1574 Richard ap Richard paid £20 to John Mortimer of Coedmore to convey a tenement called “tyr atha” at Llechryd. On 10th January 1582 John Mortimer leased the messuage together with Cilbronnau, Llangoedmor, in return for a bond of £100, to Howell Gruffydd Lloid and Gruffydd Lloid ap Reis David Llywelen of Tredroir, Cardiganshire. The tenement was referred to again as part of the Coedmore estate on 31st March 1749. It was long claimed by the congregation that the chapel was established in 1756, possibly first meeting in a farm building here. On 12th October 1779 the farm was leased by Walter Lloyd of Coedmore to Silvanus Nugent. 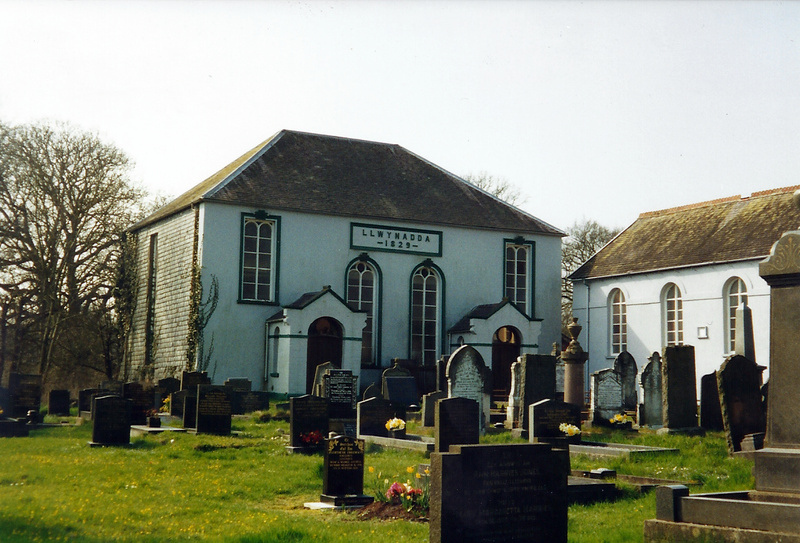 On 22nd March 1791 Llwynadda was still listed as part of the Coedmore estate, but a Calvinistic Methodist Chapel was founded or built there that year – a date stone can still be seen. The chapel building was rebuilt in 1829. 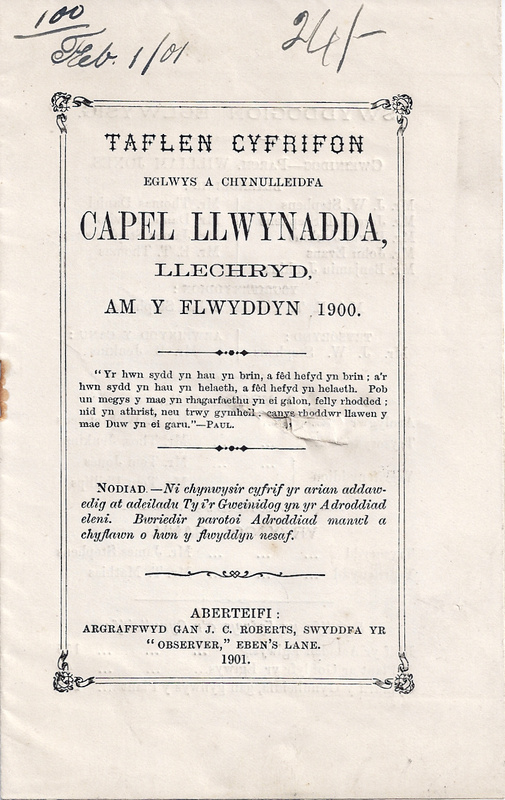 In 1841 the following persons were listed as living at Llwynadda: John Stephens, 45; Elizabeth Stephens, 40; Ebenezer Stephens, 5; Elizabeth Stephens, 3; and John Stephens, 4 months. On 3rd October 1894 Rev. W. D. Rowlands became the new Minister. On 28th April 1896 a presentation was made to the recently-married Rev. W. D. Rowlands, Minister. On 16th January 1898 Rev. W. D. Rowlands resigned as minister and left in April. On 6th April 1900 tenders were sought for building a house next to the chapel. The Annual Report for 1900 survives. Rev. William Jones was then the Minister and the Deacons were named as Mr. J. W. Stephens; Jeremiah Stephens; David Jenkins; John Evans; Benjamin Jenkins; Thomas Daniel; Daniel Davies; James Stephens and Mr. E. T. Thomas. There were then 155 members, falling to 154 in 1901 and 151 in 1902. Jeremiah Stephens, Deacon, died on 17th June 1901. In 1903 Rev. William Jones was still the Minister. On 26th February 1909 tenders were sought for renovations to the vestry and for building a stable. The chapel could seat 350 persons. In September 1912 Rev. Thomas Lloyd became the Minister until 1946. In April 1914 tenders were sought for repairs and painting. 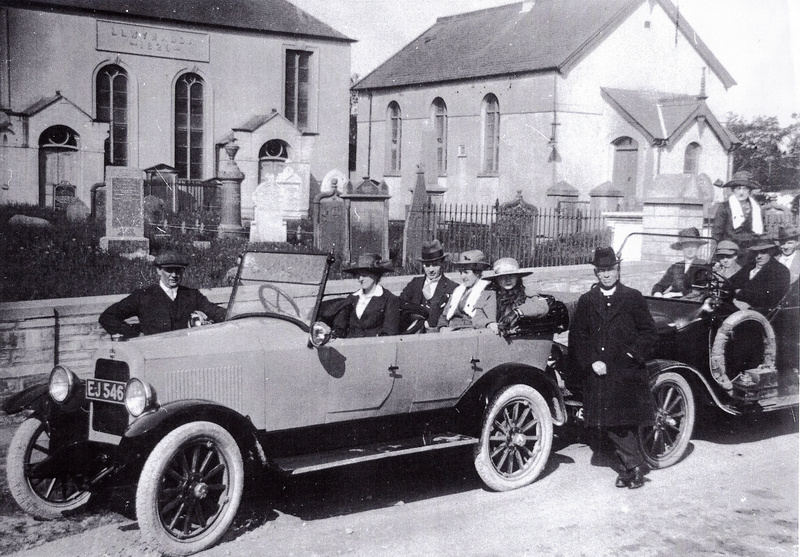 In August 1915 Mrs. J. W. Stephen of Glanolmarch presented Communion Cups to the chapel. In 1932 the following Deacons were serving: David Jenkins, Thomas Hazzelby, Jonathan Jones, J. Jacob Jones, Thomas Mathias, Tom Jones, Lyndon Lloyd and James H. Mathias. In December 1933 electric lights were installed. On August 18th 1946 Rev. Thomas Lloyd, minister, retired after 34 years here. On 28th December 1946 a War Memorial tablet was unveiled here. On 15th June 1949 Rev. Thomas Lloyd, until very recently the Minister, died aged 80. On 6th September 1950 Rev. Idris Lewis became the Minister until 2002, having accepted the pastorate in June. The Annual Report for 1952 exists. The Deacons that year were: Jonathan Jones; James Henry Mathias; Lyndon Lloyd; Evan Davies; J. Jacob Jones; David G. Lewis and J. Elias Williams. There were 107 members in 1952. On 11th September 1960 the chapel was re-opened by Rev. Idris Lewis following redecoration. On 23rd September 1960 the South Wales Methodist Association met here – claiming that this was their first meeting at Llechryd since 1759. In 1970 the Deacons were named as: James H. Mathias, Evan Davies, J. Elias Williams and David J. Jones. There were 49 members in 1970. In December 1971 Rev. Idris Lewis presented an award to James Henry Mathias for 40 years service as chapel elder here. In September 1975 Rev. Idris Lewis celebrated 25 years as the Minister. In 1980 membership fell from 47 to 43 and in 1981 from 43 to 41 and down to 40 in 1982. In 1983 Rev. Idris Lewis remained the Minister. The Deacons were David Teifryn Jones, T. J. Philip Thomas and Peter C. Hazzelby. There were 36 members that year. The same Minister and Deacons were recorded in 1986-95. The chapel became a listed building in 1994. On 20th April 2002 Rev. Idris Lewis, minister here for 51 years, died aged 82. The chapel closed for regular services at about that time. The last known service was held here in November 2003. The chapel was advertised for sale in 2013. “…EXTERIOR – 1829 Calvinistic Methodist Chapel, remodelled 1878. Stucco with hipped slate roof. Two long arched centre windows with stucco architraves and keystones and ‘Florentine’ tracery of two lights and roundel. Two outer long square-headed gallery lights with similar surrounds and centre timber mullion, arched heads to top panes. Two projecting coped shouldered porches with double panelled doors and crescent overlights with roundel. 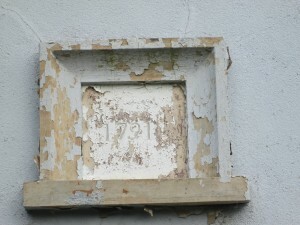 Rectangular plaque over centre, raised stucco letters ‘Llwynadda 1829’. All the external front detail is of 1878. S end wall is slate-hung with long window. Rear is half slate-hung with two long windows. N end is rubble stone with one long window. Windows have cut-stone voussoirs and 1878 glazing. [Vestry adjoining has 1791 (reused) datestone]. People of Seion, David Russell Barnes 1995. Hello. I have always been told by my father, and his uncles and aunts, and my grandmother, that my Great Grandmother, Frances Mary Thomas (nee LLOYD) from Penponpren, Newchurch, Carmarthenshire was related to a Reverend Lloyd who was a Minister in Llechryd. Frances Mary Lloyd was born in 1862 and had 6 brothers. 4 brothers were older, John, Thomas, Henry and Benjamin and 2 younger brothers named Rees and James. Some of these names she gave to her own sons. She had 11 children, of whom 7 lived to be adults (I knew most of them as they were great aunts and Uncles to me and my brothers). The name Lyndon also repeats into the next generation as my father has a cousin named Lyndon. I wonder if the Lyndon Lloyd in Llwyn Adda churchyard is a related to my ancestor, and if the Rev Thomas Lloyd was also related – perhaps a nephew or great nephew? It’s difficult to work it out, but I’m confident my Geat Uncle Ben, her son, is correct in saying he was related to a Rev Lloyd in Llechryd. He said that 2 of his uncles had moved from Newchurch to Llechryd at some time, and are buried there. I have carried out a lot of research into my family tree at both Llanelli, Cardigan, Newport Pembrokeshire. Frances Mary Lloyd married my Great Grandfather David Charles Thomas in Llanelli, and my brothers and I were born in Carmarthenshire, but we grew up in Cardiganshire as my parents moved there in 1967, and went to school in Cardigan. All 3 of us had to move away to college and then employment in England, but I still speak Welsh whenever possible. We also visit relatives in Cardiganshire regularly. Any comments from you would be appreciated. Thanks for your comments. I’m afraid I’d have to do a bit more research, as the only Rev. Lloyd I have record of at Lllwynadda is too recent. I’d love to find out more about the earlier ministers there. Good luck with your own research. Hi Fran. 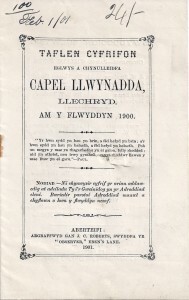 I was very interested to read your response to the article written by Glen about Llwynadda chapel in Llechryd. Like you, I have carried out a lot of research into my family tree. My Taid Thomas Lloyd was minister there from 1912 until the late 40s. He died when I was 4 years old, so it’s a pity my memory of him is very hazy. By the way, he is standing between the two cars in the photo taken in front of the chapel. He had five children, the oldest one being Lyndon Lloyd (1896-1960), who was an optician in Priory Street, Cardigan, and chapel organist. Then came Eluned and Mabel, who were twins, followed by Megan Dilys Williams (nee Lloyd), who was my mother, and lastly Elsie, who died in 2006. Thomas Lloyd was the son of John Lloyd (born 1842) who was the oldest sibling of your ancestor, Frances. As you say, they lived in Penponpren, Newchurch, where their father William (our great-great grandfather) was a pig merchant. John and his wife Sarah lived in Llangendeirne (Carms), where they brought up nine children in a two-roomed cottage. Thomas attended Trefecca College in the 1890s together with two of his brothers, William who was a minister in Pontypridd among other places, and David Henry (known as Lloyd y Cwm) who was minister in Cwmystwyth for over forty years. My parents (both teachers) moved to Wrexham before I was born and I still live here. I had an older brother, Lyn, who died in 2002. I am married with three grown-up children and six grandchildren. If you have any more family details, I would be very interested to hear of them. Your great-uncle Ben was correct but I don’t know of another uncle who was buried in Llechryd. Please keep in contact, as I’m sure we will have information to share. Thanks Ann. I’m sorry not to be able to add more information than was in the article itself, but your own information is a great addition to the page. Much appreciated. Kind Regards. Glen. It would be great to share more infornation about our family. I hope you have received my response. I haven’t been able to check that I have sent you the correct email address, so I’ve sent this quick email again to make sure. I can’t believe that I haven’t seen your response until now (over a year later), as nothing was actually sent to my hotmail email address. It was purely by chance I visited the Glen Johnson website earlier on. I had been looking on the Internet about Cardigan Grammar School as my father was the Site Foreman on the building works in 1957 and again in 1967. In fact this was the reason we moved from Llanelli to Cardigan – so that he could work on the School extension and then other building works carried out by the firm he worked for. I hope that you’re able to contact my email directly so that we can find out more about the Lloyd family tree. I was named after my Great Grandmother, Frances Mary, the daughter of the pig merchant. She later had her own dairy business in Llanell ibefore she was married, and I would like to discover more about her life there. I have found out things from my grandmother, but still searching for more regarding where her business was actually located. How interesting! My great grandfather, John Stephens (later Stevens) is the same John Stephens in second paragraph of your article. The family moved to the US by 1850 and John Stevens became a millionaire in Wisconsin when he invented the roller flour mill. I visited the chapel on my honeymoon in 1990 but was unaware of the connection. Thanks for the fascinating information!